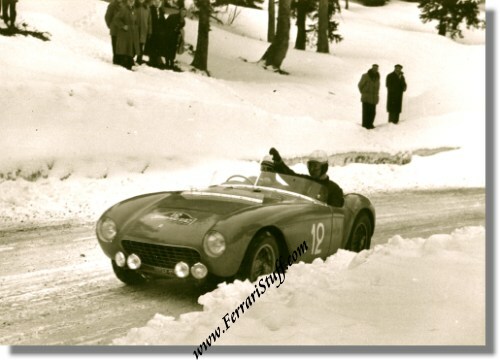 1955 Photo of Ferrari 500 Mondial Spyder Pininfarina S/N 0424MD at the Criterium Neige et Glace. This is a 1955 photo of the 500 Mondial of Mr. Dupont during its last race, the Criterium Neige et Glace in France. After this rally, Mr. Dupont traded the car with the Ferrari factory on a 500 Mondial Scaglietti which was consequently stamped with the same S/N, 0424MD. The photo measures some 17.5 x 12.5 cm or some 7 x 5 inches and is in mint condition. This appears to be a later print.